Standard UK Delivery - We aim to despatch on the same day however do allow 3-4 working days for delivery. Guaranteed Next Day Delivery - We guarantee next day deliveries for order placed before 12.00 noon on the previous working day. Our Guaranteed Next Day Delivery service is available for all UK Mainland addresses excluding the Scottish Highlands. Please note that working days exclude Saturdays, Sundays and Bank Holidays. For security reasons a signature may be required for parcels. At Hire a Sari we respect your privacy and are committed to protecting it. As required by the UK Data Protection Act, Hire a Sari follows strict security procedures in the storage and disclosure of the information you provide. We will not release your personal Information to any company outside of Hire a Sari for mailing or marketing purposes. You should be aware that if we are requested by the police or any other regulatory or government authority investigating suspected illegal activities to provide your Personal Information and /or User Information, we are entitled do so. 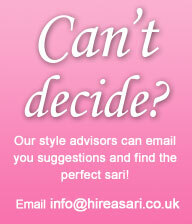 Hire a Sari are confident that you will be delighted with your order. However, if for any reason you are not completely satisfied we would be happy to offer an, refund, exchange or replacement on goods purchased provided that they are in their original, unopened and unused condition and returned within 2 days of delivery. When hiring outfits if you are not entirely satisfied please contact us within 24 hours of delivery, in order to receive a full refund. Items must be in a unused condition. If returns are not made within 2 days of delivery we can only exchange goods or replace goods. Please contact our Customer Service Department by e-mail customerservice@hireasari.co.uk or call us on 07976402119 between 9am-5.00pm Monday to Friday You will be required to provide full details of your order and details of the goods you wish to return. Please return your goods by recorded delivery (retaining your recorded delivery receipt as proof of postage) and send to the following address: 13b High View Close, Hamilton Office Park, Lewisher Road, Leicester ,LE4 9LJ Please note you are responsible for costs incurred when returning items. On receipt of the returned goods Hire a Sari will examine them before arranging an exchange, replacement or refund. We will endeavor to do this within seven working days of receipt of the goods. If, you wish to exercise this right prior to despatch of the goods please contact our Customer Service Department by e-mail customerservice@hireasari.co.uk or call us on 07976402119 between 9am-5.00pm Monday to Friday. All customers have the right to cancel there order, and receive a refund within a 7 days. If you cancel your order, or part of your order, one week or more prior to the date of your event, you will receive a full refund for those cancelled items. You have up to 7 days to return the ordered products. The goods must be unused, unopened, and in the same condition as they were originally dispatched. Cancellations less than 48 hours prior to the date stated on the conformation, will not be eligible for any refund. All notices of cancellation part or otherwise must be made by telephone or email. You will need to keep a record of the cancellation number issued as evidence of the cancellation being made. If an order or contract is cancelled for any reason the customer is then responsible for the costs of returning items to the company. We must be notified within 24 hours of the outfit being received, if you wish to change the item for an alternative. In this case the customer will be responsible for returning the outfit to the company and for any costs involved. Alternative goods and sizes are subject to availability. These terms and conditions form an integral part of your contract with Hire a Sari Uk. Here in after referred to as 'The Company'. You will notify us immediately of any changes to the Personal Information by contacting our Customer Service Department by e-mail customerservice@hireasari.co.uk or call us on 07976402119 between 9am-5.00pm Monday to Friday. "Conditions" means these Terms and Conditions and the Special Conditions; "Product" means a product displayed for sale on the Website; The "Hirer" is the person whose name & address appears at the top of the conformation contract of hire, which these terms and conditions form a part. The Hirer accepts full legal liability for the items hired on the conformation receipt, irrespective of whether the outfit is for the Hirers personal use or that of another person. Each Product purchased is sold / hired subject to its Product Description which sets out additional Specific Conditions related to that Product including, without limitation, Terms and Conditions concerning estimated delivery dates and times, warranties, after-sales service and guarantees. Our prices are stated in Pounds Sterling (£) and include Sales Tax (VAT) at the rate of 20%. Payment can be made by any of the following methods: Visa, Mastercard, Delta, Electron, Solo, Maestro and Switch. You confirm that the credit or debit card being used is yours. All credit and debit cardholders are subject to validation checks and authorisation by the issuer of the card. If the issuer of your payment card refuses to pay or does not for any reason authorise payment to the company, we will not be liable for any delay or non-delivery. We retain the legal ownership of all goods until full payment has been made by you and received by us. Legal ownership will immediately transfer back to us if we refund any payment. Deliveries can only be made within the UK .Not all of our delivery options are available to all areas of the UK. We will deliver in accordance with the delivery option selected by you. We have two delivery options available. Standard Delivery will aim to be dispatched same day however do allow 3-4 working days for delivery. If goods are cancelled and goods have already been dispatched the customer is responsible for any costs involved of returning the outfit, via recorded delivery. If goods are not suitable for reasons which are beyond the control of the company then the customer is again responsible for any costs incurred in returning the item. At Hire a Sari UK we respect your privacy and are committed to protecting it. As required by the UK Data Protection Act, Hire a Sari UK follows strict security procedures in the storage and disclosure of the information you provide. We will not release your personal Information to any company outside of Hire a Sari UK for mailing or marketing purposes. You should be aware that if we are requested by the police or any other regulatory or government authority investigating suspected illegal activities to provide your Personal Information and /or User Information, we are entitled do so. The hire period is from the date which the outfit is received by the hirer from the Company and must be returned to the Company no later than 7 days from the date in which the outfit is received. Both these dates are clearly stated on the hire conformation contract. The Company hires goods on the understanding that they will be returned in an undamaged condition and the customer will be responsible for, and indemnify The Company against, any loss or damage to the goods, at their current selling value, whilst they are on hire. For the avoidance of doubt, our customer is the person who has paid for the hire of the garments and is therefore deemed to have placed that order. The Company reserves the right to charge the hirer for the outfit stated on the site. In the event that it has been lost, stolen, damaged, or become un-hirable again. The Company has the right to keep the customers deposit in the event that the outfit has become un-hirable as well as acquiring an additional cost of the outfit. When purchasing a product the customer must be aware that some items on the site may have been hired previously and have 7 days to return the item is they are not happy with the item. All outfits must be tried on for size within 24 hours of the item being received. This will allow sufficient time for a change to be supplied subject to availability. The Company will not be responsible for any loss suffered by a customer that could have been avoided by complying with the above. We must be notified within 24 hours of the outfit being received, if you wish to change the item for an alternative or if there are any issues with your order. In this case the customer will be responsible for returning the outfit to the company and for any costs involved. The goods must be unused,unopened,and in the same condition as they were originally dispatched. The Company liability in any event is limited to the value of the cost of hire paid by the customer. Outfits should be returned to the Company 7 days after recieving the item . All packages must be returned to the post office with postage paid label attached. Please return your goods by recorded delivery (retaining your recorded delivery receipt as proof of postage) and send to the following address: Unit 7 1st Floor, Hamilton Office Park, Lewisher Road, Leicester, LE4 9LR Please note you are responsible for costs incurred when returning items. If, you wish to exercise this right prior to dispatch of the goods please contact our Customer Service Department by e-mail customerservice@hireasari.co.uk or call us on 07976402119 between 9am-5.00pm Monday to Friday. All stock is hired subject to availability. In the event that the goods ordered by the customer are not available, you will be offered an alternative or given a refund for the unavailable product(s). We must be notified within 48 hours of the outfit being received, if you wish to change the item for an alternative. The item must be returned within 7 days from the delivery date. In this case the customer will be responsible for returning the outfit to the company and for any costs involved. Alternative goods and sizes are subject to availability. The goods must be again unused, unopened, and in the same condition as they were originally dispatched. Hire a Sari reserves the right to demand a deposit from any hirer at any time up to and including the hirer receiving the goods from the Company. The amount of the deposit is to be at the absolute discretion normally (25%) of the Company. The Company reserves the right to refuse to hire goods to any client with whom it does not wish to enter a contractual relationship. The Company reserves the right to cancel a contract at any time and without notice, where upon it will refund to the hire any monies paid. Following such a refund, no further liability will exist between the hirer and the Company. All refundable deposits at 25% will be returned within 48 hours of the Company receiving the outfit, and in compliance with the terms and conditions stated. Unless items are returned damaged and therefore the amount of refund and time will depend on costs occurred. All prices displayed on the site are subject to the value of the item hired, and include Tax.